Jason Bainbridge is chair of Media and Communication at Swinburne University of Technology, Australia. He has published widely on screen culture, comic books and popular culture more generally. Jennifer Beckett is a lecturer in the School of Culture and Communication at The University of Melbourne, Australia. She is a researcher, writer and social commentator who works in the fields of public communication, social media, cinema, and the psychology of trauma. Elizabeth D. Blum is Professor of History and Associate Chair at Troy University. She is currently working on her second book, tentatively entitled Growing Up Green: Children and Environmental Messages About Nature. Liam Burke lectures and researches in Media and Communications in the Faculty of Health, Arts and Design at Swinburne University of Technology. His research areas include cinema, comics, adaptation studies, and new media & migration. His most recent book was The Comic Book Film Adaptation: Exploring Modern Hollywood’s Leading Genre. Perry Dantzler is an assistant professor at Georgia Gwinnett College. She completed a doctorate in Philosophy of Doctrine in Rhetoric and Composition from Georgia State University with a dissertation on literacy and technology in the college classroom. Her thesis for a previous M.A. in English Literature was Static but Fluctuating: The Evolutions of Batman and His Audiences. Sasha-Mae Eccleston is an Assistant Professor of Classics at Pomona College. Her research interests include Latin literature, intellectual history, and Classical reception. She is currently completing a manuscript on Platonist narrative ethics in the works of the Roman North African, Apuleius. Wolverine, from the X-Men comics, is her favorite superhero. Masani McGee is a doctoral student and writing instructor at the University of Rochester. Her research interests include horror and fantasy film with an emphasis on portrayals of masculinity. 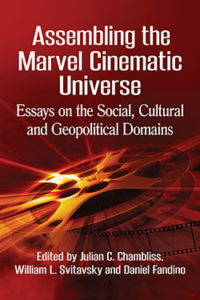 Her previous work includes “Big Men in Spangly Outfits: Spectacle and Masculinity in Joss Whedon’s The Avengers” and “The Godmothers of Them All: Female-Centered Blaxploitation Films and the Heroines of Joss Whedon” in the forthcoming book Race and Ethnicity in the Works of Joss Whedon. Antony Mullen is a PhD student at Durham University where he is also a Teaching Assistant in the Department of English Studies and a Pemberton Scholar at University College. He completed postgraduate studies at Newcastle University where he researched the construction of the nation in 1980s fiction; he has published and presented research papers on this area as well as on literature and film more broadly. Samira Nadkarni‘s publications trace her interests in postmodern poetry and performance, pop culture, hermeneutics, ethics, fan studies, and digital texts. She sits on the editorial board for the undergraduate journal, Watcher Junior, writes reviews for the speculative fiction and fantasy magazine, Strange Horizons, contributes to the digital poetry project, i <3 e-poetry, and has had her creative writing published in New Writing Dundee, Grund Lit, and Causeway Magazine. She is also collaborating with Ensley F. Guffey to co-edit and contribute to a collection of critical essays titled War in the Whedonverses, forthcoming with McFarland and Co in 2019. Lisa K. Perdigao is Humanities Program Chair and Professor of English at Florida Institute of Technology. Her research and teaching interests are in the areas of American literature, film, television, comics, and YA literature. She is the author of From Modernist Entombment to Postmodernist Exhumation: Dead Bodies in Twentieth-Century American Fiction (Ashgate, 2010) and co-editor, with Mark Pizzato, of Death in American Texts and Performances: Corpses, Ghosts, and the Reanimated Dead (Ashgate, 2010). She has published articles on numerous films and television series, including Arrow, Agents of S.H.I.E.L.D., Avengers: Age of Ultron, Buffy the Vampire Slayer, Dollhouse, Firefly, Serenity, Community, Fringe, Glee, Inception, and Memento. Jennifer Rea is Associate Professor of Classics at the University of Florida. Her research explores the intersections between ancient Rome and modern science fiction and fantasy. James Rovira is Chair and Associate Professor of English at Mississippi College, where he teaches British literature, creative writing, and theory. His book Blake and Kierkegaard: Creation and Anxiety was published by Continuum in hardcover in 2010 and in paperback in 2011. He has recently published in Blake: An Illustrated Quarterly, Nineteenth-Century Studies, and elsewhere in addition to publishing fiction and poetry. He has presented at national or international conferences for the MLA, ASECS, ISECS, ICR, and NASSR, and currently lives in the greater Jackson, MS area with his wife Sheridan and children. Derek Sweet, an associate professor of Communication Studies at Luther College, explores the intersection of rhetoric, popular culture, and politics. He is an avid fan of Star Wars, Iron Man, Buffy the Vampire Slayer, female fronted punk, and specialty coffee. Sarah Zaidan is an Assistant Professor of Visual and Media Arts at Emerson College, where she teaches game design. She is both a scholar and creator of video games and comics, including the feminist superhero series My So-Called Secret Identity, and her research interests include narrative, gender and gameplay. Find out why #MSUCAL English Professor @JulianChambliss came to @michiganstateu to study comic books.